After spending over a quarter of a century convinced that speaking French was a sign of cultural illegitimacy, the Cajuns experienced a resurgence in the celebration of their culture in the late 1940’s. The shift eventually led to the Council for the Development of French in Louisiana (CODOFIL) putting on the first Tribute to Cajun Music concert in 1974 in Lafayette's Blackham Coliseum. Now formally known as Festivals Acadiens et Créoles, this year marks the 43rd anniversary of the event. Held every year in Girard Park in Lafayette, this year's festival is set to bring together some of the best Cajun bands in the area to celebrate French language and culture. The event is an opportunity for local musicians to show the crowd and fellow musicians what they’re made of. The musical line up is as jam packed as ever with raw musical talent, but this year festival organizers decided to shift the focus a bit to the makers of the instruments. These instruments will be on display at the University Art Museum, A. Hays Town Building, on campus and will display fiddles, accordions, guitars and percussion instruments, some dating back to the 1940s and ‘50s alongside the newer versions being made today. The exhibit opened in early September and will close the final day of the festival. Festivalgoers can take part in everything from the Tour des Atakapas race and duathlon put on by T.R.A.I.L. to French mass on Sunday morning to the delicious food and drink that will be for sale at the festival. As hard as the 25 festival committees work to make sure the event goes smoothly, the public is a vital part of keeping the festival free. 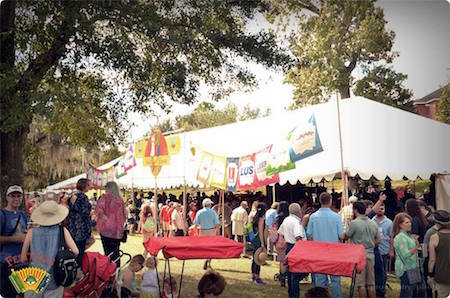 The festival will open with the traditional cutting of the boudin at 5 p.m. on Oct. 13, and afterwards the mini-links will be passed out to the crowd. Mould has attended every festival since the inaugural event, but since getting involved in the planning side of the festival 24 years ago, he has worked hard to grow the event into an affair that attracts people from around the world. To view a line-up of this year’s musicians or for more details about the event, visit festivalsacadiens.com. Guests are invited to bring their own lunch, or they can purchase a meal through participating restaurants around the Parc. All proceeds benefit the Lafayette Science Museum and help fund future exhibits and educational programs. Simply put, the Zydeco Pancake Breakfast is a fun, family-friendly event that the entire Lafayette and surrounding communities are invited to attend. Tickets are sold throughout the community for $7.00 each and entitle the bearer to receive All You Can Eat pancakes, sausage, coffee, milk, juice, soft drinks, as well as access to a Kids Area filled with games, face painting, crafts, fun jumps and more. Participants can enjoy the sounds of the local musical group, Terry and the Zydeco Bad Boys. You may prefer to sit and listen to the band, while others make their way to the dance floor to work off the syrup and sausage. Drive thru service is also available. Starts right after Festival Acadiens et Créoles ends and there is a $15 cover. Roddie Romero & The Hub City All Stars are a renowned, Grammy nominated Louisiana band who have been performing worldwide at the most prestigious venues and festivals and venues for over 25 years. Behind Roddie's Romero's soulful vocals, pumping accordion and slide guitar mastery lies the Louisiana roots sound of The Hub City All Stars, funky Hammond B-3 organ, boogie-woogie piano, hard-driving upright bass, Creole drumming, and tasteful roots guitar. American music is Roddie Romero & the Hub City All Stars, born out of the Delta dirt, rising high off the levee of traditionalism and into the future of Louisiana Music.